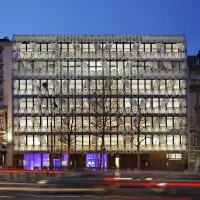 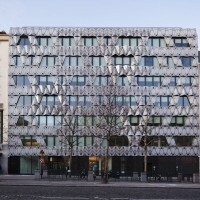 Manuelle Gautrand Architecture have completed the Origami office building in Paris, France. 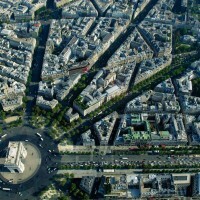 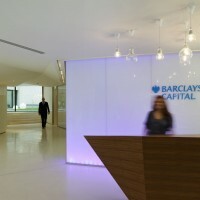 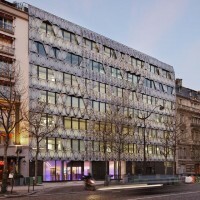 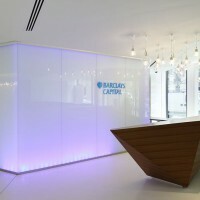 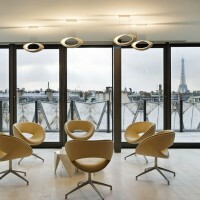 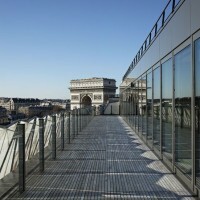 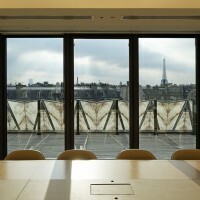 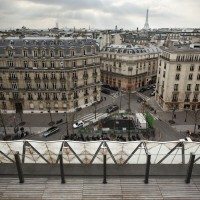 Situated within 200 metres from the Arc de Triomphe and now hosts the French headquarters of the Barklays Capital Bank. 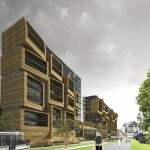 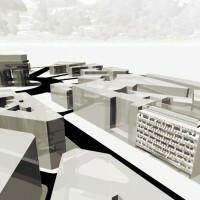 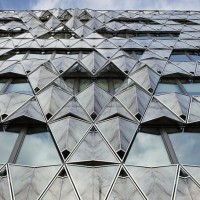 The building was designed and developed with a strong sustainability approach. 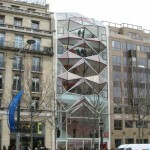 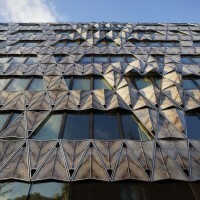 The façade is dressed in a double skin of glass and, in an origami manner, with its pleated marble pattern it forms a sun-screen in front of a curtain wall. 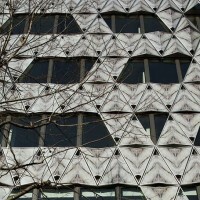 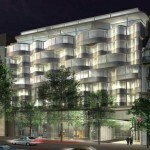 It gives a desired mineral touch which thus contributes to the building’s integration into the neighborhood. 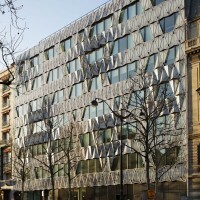 This office building stands on avenue Friedland, in the immediate vicinity of the Arc de Triomphe and Place de l’Etoile, in a luxurious Parisian neighborhood. 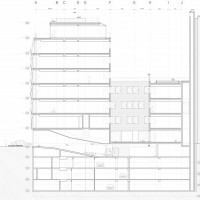 The project was implemented in two parts: the main building on a 20 meter-wide stripe on the avenue, and an extension in the rear, between two courtyard gardens. 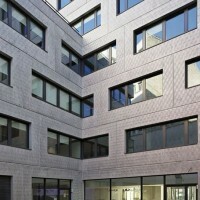 At the ground floor level, the lobby plays on transparency between the street front and the main garden. 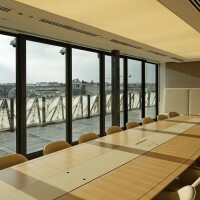 The building in the rear of the lot is more private, and it is there that the cafeteria and meeting rooms are laid out, with garden space on both sides. 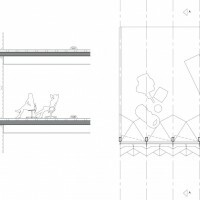 The unusual location of the site led us to design a project that would embrace and take advantage of the view and immerse into the natural light. 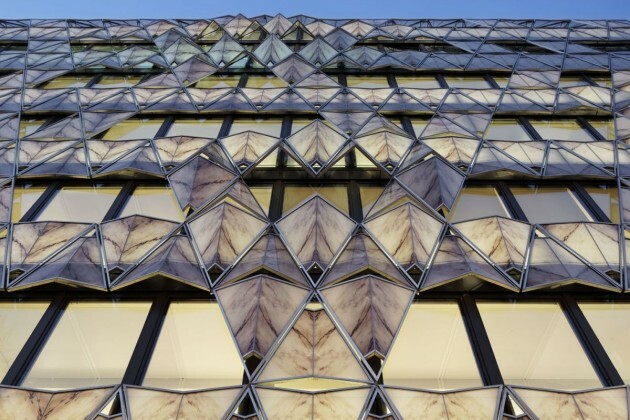 An emblematic showcase of the building – the main façade is mostly glass, partially covered with a second-skin of screen-printed marble pattern. 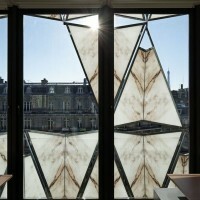 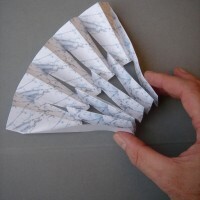 The rendered effect is a tremendous origami and the view of this delicate folded marble can be enjoyed both from exterior and interior of the building. 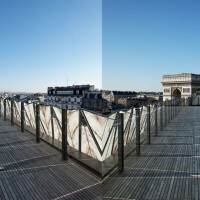 The panels are composite, a film of marble mounted on a twin layer of glass. 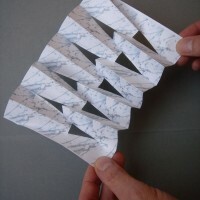 The symmetrical panels that are folded and assembled by two form an “open-book” pattern and thus highlight the design of the veins of the marble. 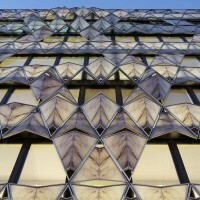 This second skin is translucent and acts as a breast wall to ensure privacy as well as filter daylight, creating a soft interior atmosphere. 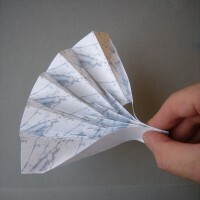 Marble folds create a vibration along the 30 meter-long front. 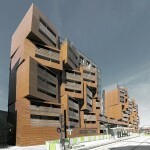 At both ends, in continuity with the façades of neighboring buildings, the origami becomes calmer and flattens out. 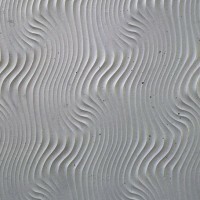 But in the central part it forms a delicate bas-relief. 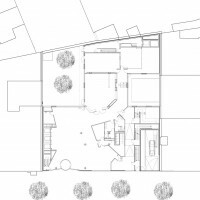 The project then develops into the depth of the site with the same objective of clarity while adding a strong presents of plants. 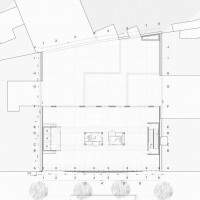 The offices roofed with large lawns weave around the two courtyard gardens. 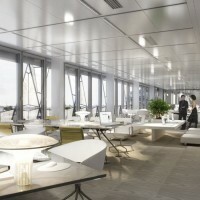 The lobby functions as a meeting point of these two atmospheres – the urban and sophisticated of the main façade, and the more private and verdant of the other side of the building. 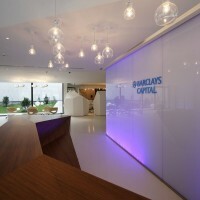 The interior spaces were designed in a contemporary spirit, highlighting the luminous atmosphere with light-colored and soft materials. 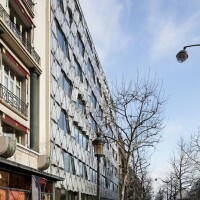 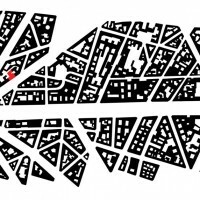 Visit the Manuelle Gautrand Architecture website – here.